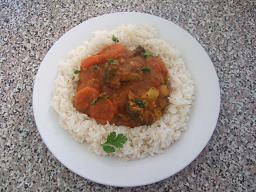 If serving with rice put in a suitable saucepan and cover with water. If serving with jacket potatoes preheat oven to 200°c / 400°f / Gas Mark 7 and pop potatoes in when heated. Chop onions finely and fry gently in the olive oil until softened. Finely chop garlic and ginger and add to onions. Slice chillies and add half to pan. Stir until chicken has whitened and add the curry paste. Turn heat to low, pour in tinned tomatoes and half of the coriander and stir well. Allow to simmer for 45-60 minutes with a lid on. Add créme fraiche, tomato puree and coconut and stir until dissolved. Allow to simmer for 30 minutes without a lid to thicken the curry. Add the rest of the coriander, saving a little for garnish. Peel and quarter the mushrooms and add with halved tomatoes, yoghurt and black pepper to taste. If serving with rice top up the water in the rice and put on to boil. 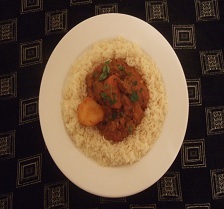 Serve with the rice or jacket potatoes and garnish with the remaining coriander and chillies. If you want a creamier dish add more créme fraiche or fresh cream. 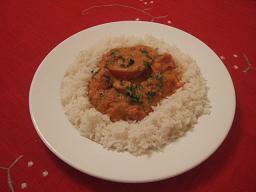 Serve with the rice or jacket potatoes and garnish with the remaining coriander. Chop onions finely and fry gently in the olive oil until softened, use a lid. Add créme fraiche, tomato puree and coconut (if using) and stir until dissolved. Gently fry the onions in the olive oil until they have softened. Cut the chicken breasts into 2.5cm/1" cubes. Add the garlic, cubed chicken and curry paste and fry for a few minutes, stirring constantly. Chop the lemongrass into 2.5cm/1" lengths if using fresh. Add coconut milk, green beans, bamboo shoots, galangol, lemon grass, palm sugar and tomato puree. Stir well and then simmer for 15 minutes. Half or quarter the mushrooms. Add mushrooms and simmer for a further 10 minutes. Finally stir in bean sprouts and season with black pepper. 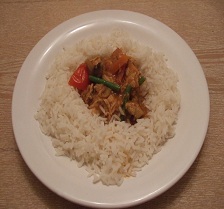 Stir well and then serve with boiled or thai rice. You can use any meat or fish for this. 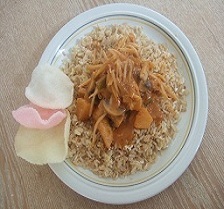 This is a lovely sweet curry that the children love. You can use soft brown sugar if you have no palm sugar (not as good though). Add coconut milk, green beans, galangol, lemon grass, palm sugar and tomato puree. Quarter and half the tomatoes and add to the pan. Chop lamb into cubes and add to pan. 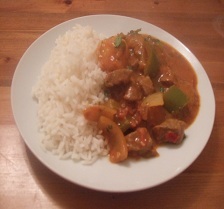 Stir until lamb has browned and add the curry paste. 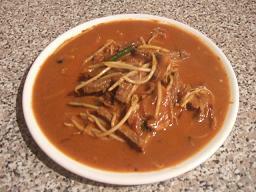 Turn heat to low, pour in tinned tomatoes, half of the coriander and the lime juice and stir well. Boil until just cooked and drain and save for later. Add tomato puree and coconut if using and stir until dissolved. Peel and quarter the mushrooms and add with halved fresh tomatoes, yoghurt, potatoes and black pepper to taste. The longer you simmer the dish for the softer the lamb gets. If you want a creamier dish replace the yogurt with créme fraiche or fresh cream. 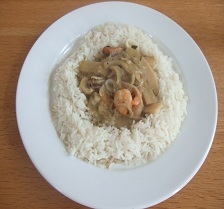 Put rice in a large saucepan and cover with water, the rice will serve 4-6 people and the curry 12, so adjust the rice accordingly. Peel, half and quarter the onions and fry gently in the olive oil until softened (use the lid). Penl and dice the potatoes into about 5cm/2" cubes and cook, making sure they don't go to soft. Drain potatoes and leave to the side to cool a bit. Finely chop garlic, chilli (if using) and ginger and add to onions. Trim and dice the lamb and add to pan. Deseed, trim and cut the green peppers into 2.5cm/1" squares and add to the pan. Turn heat to low, pour in the tinned tomatoe and, potatoes. Finely chop the coriander and add about three quarters of it and stir well. Add yoghurt and black pepper to taste. 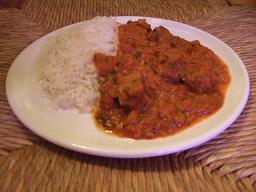 Serve the Lamb Jalfrezi with the rice and garnish with the remaining coriander. This recipe easily makes enough for 3 meals for 4 people, so freeze some easy meals another time. Add tomato puree and the coconut if using and stir until dissolved. Peel and quarter the mushrooms and add with halved fresh tomatoes, yoghurt and black pepper to taste. 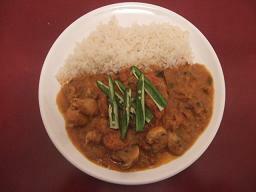 Serve the Madras with the rice and garnish with the remaining coriander. 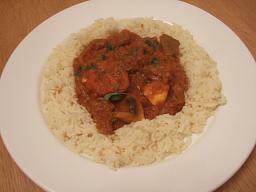 Serve the Rogan Josh with the rice and garnish with the remaining coriander. Put rice in a suitable saucepan and cover with water. 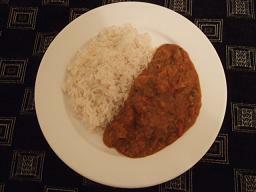 Serve the Vindaloo with the rice and garnish with the remaining coriander. Finely chop the chilli and trim the green beans. Finely chop the garlic and slice the chillis. Add the garlic, chillis and curry paste and fry for a few minutes, stirring constantly. Stir well and then simmer for 10 minutes..
Half or quarter the mushrooms and finely slice the beef. Add mushrooms and beef and simmer for a further 10 minutes. 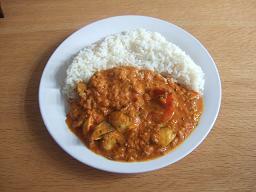 Add more or less paste according to how hot you like your curries. Add coconut milk, green beans, bamboo shoots, galangol, lemon grass, fish sauce and palm sugar. Finally stir in bean sprouts, prawns and mixed seafood and season with black pepper. You can use any meat or fish for this. If using uncooked meat or fish add with the mushrooms.